We all love our smartphones and tablets, but nobody can deny that the touch screens are always finger-print magnets. Our shiny devices seem to pick up a lot of dirt and grease thanks to the constant need to touch them. Yes, you can keep cleaning your device, but better solutions are needed. 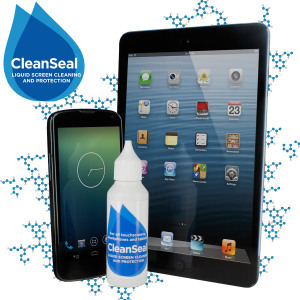 So when I heard of CleanSeal’s Liquid Screen Cleaning and Protection, I thought I’d give it a go! One of the simplest products that exist. A bottle full of the specially designed liquid, with a special dropper top, that delivers you the liquid one drop at a time. A microfibre cloth accompanies, which you can use to apply and clean surfaces. Once applied, this promises to keep your touch screen cleaner for longer, and relatively free from fingerprints. One of the best things about this is that it is incredibly easy to apply. Just drop 5 drops on your smartphone, about 8-9 on a 7″ tablet (e.g. Nexus 7/iPad Mini), or 12 on 10″ tablet (such as the iPad), and then softly rub it in using the supplied microfibre cloth. Once done, leave it for 5 minutes, and the applied layer should be good to go. What else can I use it on? Theoretically, you can use it on surface you like. I have actually applied it on my glasses, and you can use it on your laptop screen, your TV, or even general glass surfaces. Nanotechnology is a word I am a big fan of, and this is another one of those miracles. This technology basically attaches itself to your screen, and provides a slippery surface to fingerprints, bacteria or grease. As a result, while it is not impossible to leave marks on your screen, there is a less likelihood of them sticking there. As good as you’d expect really. As I mentioned, it is not impossible to leave fingerprints, but the screen is cleaner, and once applied, it is also easier to clean items and grease off of it. I particularly like the fact that I have applied it to my glasses, and they have been cleaner since! It also has the ability to fill in very minute scratches, and while I wasn’t able to test it, that is a great perk to have! It retails for £9.99, a single bottle works for about 70 applications. Pretty much a no-nonsense kind of a buy this, as long as you own a touch screen. Obviously, remember that while this gives you a protective layer, it isn’t magic, and unlike Tomorrow’s World, eating jam off your touch screen is not recommended! do not buy this product from mobilezap, surry hills, sydney, aust. they want $32.95 shipping to adelaide, aust. i ordered mine from the uk at $5.68 shipping to adelaide, aust.